How can platforms improve financial inclusion in Africa? The Internet does platforms well. By the late 1990s, eBay was growing like gangbusters, partly—but famously—by hosting the exuberant exchange of beanie babies among collectors. Later, Facebook and Google leveraged network effects in social media and search to grow massive multi-sided markets in attention and advertising. More recently, innovators like Alibaba (direct to consumer sales) and hundreds of others are changing not only online experiences but also real-world livelihoods and economies impacting billions of people around the world. Indeed, the Internet does platforms so well that it’s fair to say that the digital “platformization” of markets is one of the defining forces of change in the shift to digital economies. Moreover, platformization presents both new possibilities and new challenges for developing countries. FiDA is exploring the impact of platformization on financial and economic inclusion in Africa through Caribou Digital’s multidisciplinary platformization lens, which combines perspectives ranging from management studies and economics to sociology and media studies. In 2018 and 2019, we are extending that lens to identify how platforms can promote financial and economic inclusion. Platforms are mechanisms for hosting interaction and exchange between third parties in which the host (a) facilitates value creation (financial or otherwise) and (b) takes a share of that value but (c) doesn’t completely control the scope of interactions or their outcomes. This lens helps us reveal and isolate a variety of platform functions. 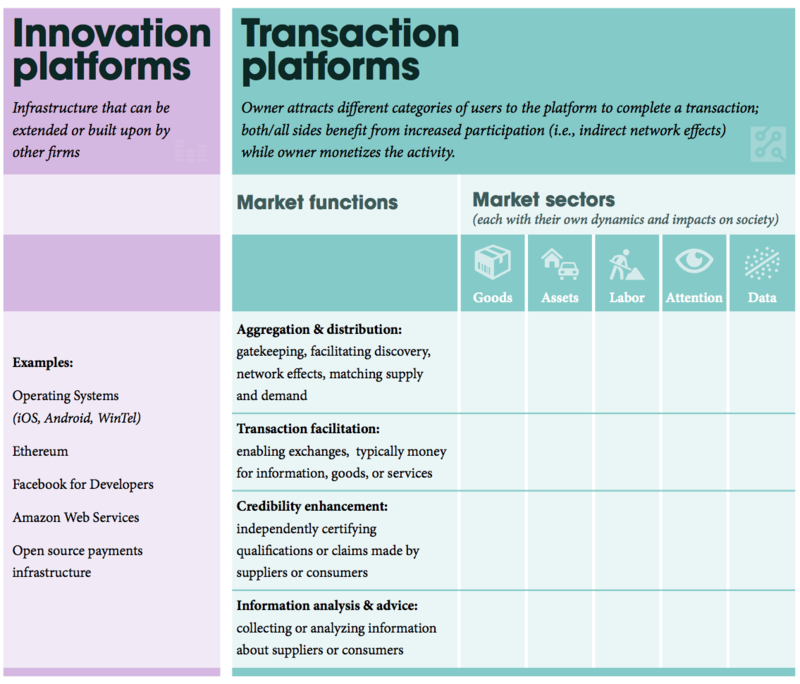 Sources: Platform types—Cusumano, Gawer & Yoffie (2018); Market functions in transaction platforms—Drouillard (2017), Palepu and Khanna (2010); Sectors—Caribou Digital Analysis. Are there different kinds of platforms? The split In the lens—innovation vs. transaction— illustrates a well-documented diversity in platforms. Echoing Cusumano, Gawer & Yoffie (2018), who remind us that some platforms are infrastructures for innovation and others are hosts for transactions. Innovation platforms, like operating systems or developer tools, emerge when an institution invites others to use its code or other assets to encourage further innovation in the provision of products and services. The more one can do with the host’s infrastructure, the more apps that run on the host’s operating system, or the more records that a host’s database contains, the more value everyone (hosts and contributors alike) can create through the system. Google’s Android operating system, Amazon Web Services, and Ethereum’s blockchain computing offerings are notable examples of innovation platforms. Transaction platforms create multi-sided markets by hosting interactions that match buyers and sellers. Transaction platforms are proliferating and touch every sector of the economy, from goods and shared rides to gig work and advertising impressions. eBay’s marketplace, Google’s paid search, and AirBnb’s homestays are examples of transaction platforms. In 2018 and 2019, much of FiDA’s research will focus on transaction platforms. How does platformization work? The vertical axis of the grid brings in economics and management thinking about market functions and pivots attention from discrete institutions to the underlying concept of platformization. Drawing on earlier work by FiDA’s Marissa Dean (in turn drawing on Palepu and Khanna), this axis distinguishes four basic functions with bearing on the structure and performance of markets and transactions: 1) aggregation and distribution, 2) transaction facilitation, 3) information analysis and advice, and 4) credibility enhancement. What are the impacts of platformization? The horizontal axis of the grid illustrates the different ways in which transaction platforms affect markets in goods, labor, assets, attention and data. Distinct communities of practice, critique, and inquiry have coalesced to explore the social and economic impacts of platforms around each of these domains. The grid allows us to look for commonalities between these conversations while preserving key distinctions. What happens if platforms are wildly successful? One caveat is important here: this lens does not capture the benefits or risks associated with the runaway success of a handful of the biggest platforms—what our colleagues at the FIBR project call the superplatforms. Thanks to network effects or other favorable structural factors, when superplatforms compete in a winner-take-all market, they exert outsize influence on the shape of an entire industry. If superplatforms extract a greater than merited proportion of the value created or discourage local or regional competitors, then they deserve scrutiny for potential detrimental effects. Additionally, when platforms that are successful in one industry harvest data, market to captive customers, or otherwise leverage network effects in order to enter new or adjacent industries with an inbuilt advantage, there are similar anticompetitive considerations to take into account. Neither of these important policy questions are directly reflected in our lens, but they should be included in broader conversations about platformization and development. The platformization lens allows us to critically analyze digital platforms at the intersection of their marketplace functions as well as the sectors of the economy they touch. The result of this exercise is a set of tactics and partnership strategies employed by digital platform organizations and linked to specific implications for development, prosperity, and inclusion. Aggregation and distribution market functions: Upwork works with enterprises to disaggregate demand for tasks that can be performed with access to a computer. It also offers a flexible workforce to small businesses and enterprises. Both of these elements decrease slack and matching friction in the labor sector. Moreover, as gig workers use Upwork to expand their trade rings, their income generating opportunities grow. Transaction facilitation market functions: Upwork offers escrow/milestone based payment options and a pathway for recourse if something goes wrong with a transaction. This gated process increases trust among businesses and workers transacting remotely, which in turn impacts the level of formal employment activities (via Upwork and other gig-work platforms). Any one of the discrete functions offered by Upwork or its kin could be the the anchor point for an intervention designed to promote financial inclusion and broader-based economic participation in sub-Saharan Africa. But the lens underscores how important it is to unpack the details and acknowledge that these elements may not be equally beneficial to workers at the margins of the digital economy. The lens is applicable to a variety of development challenges in the digital era, including employment, innovation, and participation in civil society. Each application would generate a specific set of elements connecting stakeholder behavior, sector dynamics, and outcomes. In 2018 FiDA is applying this lens to financial inclusion. We see the lens as a powerful tool for exploring literally hundreds of digital platforms operating in Africa—both domestic and international—to assess their prospects for delivering financial services and furthering the economic activity of underserved individuals, small businesses, and developing economies. Later in 2018 and in 2019, we will complement the work currently underway with interviews to better understand how platformization is affecting partnerships with bearing for financial inclusion. We will also look at how platformization is impacting the livelihoods of micro and small enterprises. Stay tuned and please tweet or contact ideas@financedigitalafrica.org to get involved or give feedback.